A couple of Sundays ago I had a peaceful Sunday afternoon of dressing up just for me. I saw this necklace and earrings set in my jewelry box that was my grandmother's and decided to put them on since I had a black ruffled top on. I rarely wear black but since my hair is turning a bit gray, it appeals to me more. 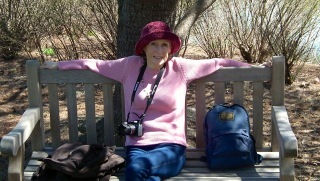 Didn't go anywhere ... just watched "Squirrel TV" on the screened porch chaise. But it was a bit of fun. How we see ourselves has a lot to do with healing. Spend some time pondering the quote above. 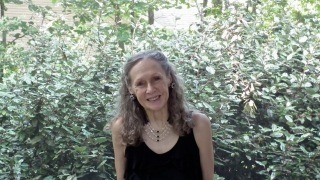 My husband took the pictures. This end of the screened porch provides a privacy fence of bushes. You can see the house next door in the picture (beige vinyl siding). It's been vacant since early Spring. Tidbit - Cats - Have you ever wondered why women and cats have such strong relationships? Specifically, why some women tend to collect large numbers of cats? While you’ve heard the term “crazy cat lady”, you never hear of “crazy gerbil ladies” or “crazy ferret ladies.” A recently published study in the journal Behavioral Processes indicates the answer lies in a special bond that exists only between cats and women. Scientists took a hard look at the behavioral interactions between 41 cats and their human companions, using individual personality assessments of both their human and feline subjects. Their findings might very well cause a paradigm shift in our understanding of these relationships. If you've not read this post from September 8th, it's quite interesting. 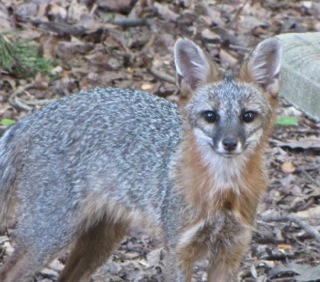 Critters - Gray Fox - We love seeing our foxy friend. We toss our fruit and veggie scraps over the deck rail so the wildlife can enjoy it more than the landfill. This Gray Fox is fast and what you'd called hyper in the human realm. Heightened nervous system for sure. Mr. Fox doesn't stay around very long and getting good pictures of foxes at dusk while they're moving is not an easy thing to do. I got 3 great shots and kept 2 of them. He was already behind the pond running towards the woods, but stopped instantly when he heard the noise of me opening the porch door and saw me. He came back a bit to the pond area and stood absolutely still as I've ever seen a fox stand, just looking intently at me with those eyes that said, "Okay, now it's time for more food, right?" He had been to the area we toss the fruit and veggie scraps with nothing to show for it. 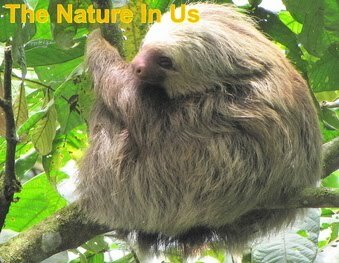 We don't make it a daily thing so the wildlife don't expect that and become dependent on it. What a great evening of "Squirrel TV" I had. It's why we don't bother with "real" television reception at all. What's Squirrel TV? We sit in our chaise chairs on the screened porch after eating dinner outside and enjoy "Squirrel TV." My sweet husband came up with that name when we had a rope hammock that was getting old and the squirrels began using it to run over and under or hang from or travel up and down on rope pieces that looked like a ropes course. They are the ones who designed it with a bit of teeth action on the rope. They seemed to delight in playing on that for a couple of years until it finally fell to the ground. The SWAT (Squirrel Whirls and Twirls) Team Training Ground. 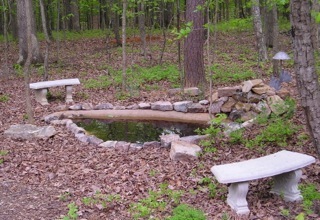 Backyard Garden Ponds - We have put in a pond at our previous home of 11 years in Alabama and when we moved here to Virginia it was scheduled for doing. We like frogs and providing a place for dragonflies to breed, besides the fact that the wildlife certainly treasure a water source. That's why we don't do plantings around it, so there is free access at any point for the wildlife. 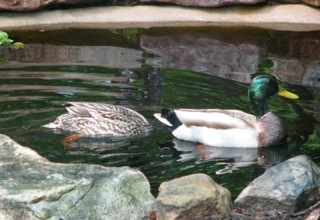 Ever since we had a visit by a pair of Mallard Ducks on Mother's Day in 2006 we've had duckweed in the pond. What a delight to see ducks in our 5x8 pond, but the over-wintering duckweed has made itself a permanent home. However, we did discover it's a good plant for the health of the pond ... until it gets totally covered and continues to grow deep if you don't take it out. Using the skimmings for plant food is a great recycle for it besides being a good motivation to get the job done. It was a few years of skimming until we discovered that Water Lettuce competing for the nutrients will keep it under control so it was great to see it no longer take over. Only issue now is that the Duckweed gets an early start and the Water Lettuce we can't even buy until May and it requires sun to reproduce itself. Since we put the pond, some of the young Black Gum trees have grown taller so it gets only dappled sun ... and not many dapples at that! It's a great "compost" for plants and Randal uses it for that, but we have to be sure to keep it close to the pond so the Water Striders can return along with other things that might have not been noticed in the "scoop." Water Striders eat mosquito larvae so we're happy to have them camping out here at the Bluebird Cove Wildlife Habitat (as we call our one acre lot). We have a lot of beneficial bugs in the pond and don't want to lose them. So we skim and make a pile of it by the pond. A few hours later, he puts it around some plants that aren't yet established to give them some extra nutrition since we don't use chemical fertilizers. Health - Nuts and Seeds - Just in case you missed the post last month on nuts and seeds being a very good thing for heart disease, I am mentioning it here. Too often we are caught up in low-fat diets and nuts are not considered a good food. Science researchers are showing otherwise. There's quite an amazing list of information on benefits for the heart which is my focus these days. I found a recipe for Chunks of Energy, altered it and put it together on one of my good days. Basically it's chopped nuts and seeds in the food processor and Chop up the nuts in food processor and 1 cup each of carob powder (chocolate alternative), honey and peanut butter mixed in a bread mixer with a dough hook . It's a complete protein for vegetarians since peanuts and carob are legumes. Protein is another thing I have to watch out for being a vegetarian and not enjoying dairy foods. FYI on carob: The Carob Tree (Ceratonia siliqua) is native to Syria but is cultivated in other Mediterranean countries. Carob was the "locusts" that were the food of John the Baptist and the Prodigal Son. The large pods have served as livestock feed for ages. This gets really thick so you will need a bread mixer that does bread dough along with the attachment for it. And don't forget to chop the seeds. Your assimilation of the nutrients will be better if you grind them up. You can swap up the nuts and seeds with what you have on hand or desire. Walnuts have Omega 3's which are really great to include. 1. Put honey in mixer, add peanut butter and mix well and then add the carob powder. 2. Pour in the chopped nuts and seeds. 3. Press into oiled 8 by 8 inch pan. Chill for 1 hour. Cut into 25 small squares. Keep in fridge for up to 1 month; freeze indefinitely. The House Wrens have flown from their the frog frog birdhouse a couple weeks ago. The front porch sojourners have come and gone. A few days, maybe a week, after I saw they had left I looked out on the deck where I'd recently watered the potted plants and filled up the bird bath. There under one of the chairs was one of the young house wrens, the first juvenile I'd seen on our property. How sweet. 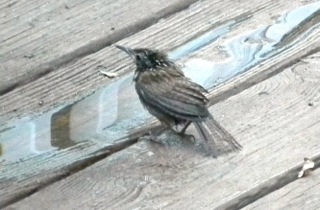 It obviously hasn't found the bird bath yet or is maybe a bit too intimidated by the depth of the water which is less than 1 inch ... for whatever reason it was down on the deck floor taking a bath in a small puddle of water that had been left from the runoff till I got the hose turned off. He took a long bath. I had to go for my camera and was able to get oodles of shots while it delighted in the fun time at the pool. Earlier this year during migration time we had an exciting visitor flittering around our bushes and trees. A male Black-throated Blue Warbler. It definitely wasn't a regular visitor and I only got a few not-so-good shots of him because of the constant movement. Plus my friend who was to visit rang the doorbell shortly after I'd begun shooting. Friends are always more important than birds. When I zoomed in on the uploaded photos I realized it was the mentioned warbler that had visited us years before. I checked when the previous better photos were taken and it was on October 9, 2006. [View the Black-throated Blue Warbler photo.] Nice to see one again. I am hoping that we will see it during Fall migration. 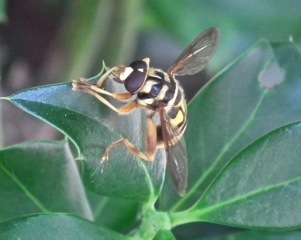 Insects - Flower Fly (Milesia virginiensis) - Flower flies are dead ringers for bees or wasps often being mistaken for Yellow Jackets, hence they also have the name of Yellow Jacket Mimics. Despite their appearance, not only are they harmless, they are valuable pollinators of flowers. Look for adults buzzing in sunny spots in open woodlands or along forest edges in the eastern and central regions of the continent. This is the "news bee" of folklore, named for its occasional habit of hovering in front of a person and "giving them the news." This lovely fly made it onto a series of insect-themed postage stamps in 1999. Tidbit - Rice Field Art - Since 1993, the farmers of the Japanese village of Inakadate, in Aomori Prefecture, has been creating elaborate designs on rice paddy fields by intermixing a variety of rice strains to create large scale artworks. Each year these farmers plant rice of different color to create new artworks and they last all through the growing season until the time of harvest. Over the years they have made classical art pieces like Mona Lisa, and images of historical figures such as Napoleon, and Marilyn Monroe, as well as traditional Japanese icons and figures. To see these artworks, a tall viewing platform is erected and hundreds of thousands of visitors come driving from all across Japan clogging the narrow streets of this quiet community with hours-long traffic jams. Spiritual - The whole process of being "fearfully and wonderfully made" is an amazing thing. I just finished watching the You Tube video, Louie Giglio Talks About Laminin. It's very thought-provoking and really shows how much God loves us and what a miracle our bodies truly are. If you've been struggling with feeling less than worthy for anything, PLEASE watch this 15-minute video. The ending is spectacular after you hear the up front details. It's worth your time, I assure you. If you've already seen it, view it again. We need reminders of who we truly are and how God really sees us! View the video. 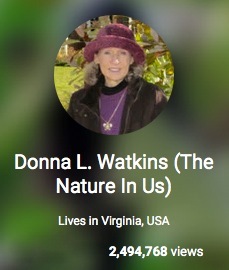 Exciting News for The Nature In Us - I have been amazed as I've watched the number of views on Google+ social network climbing since I joined up in June 2012 to share my posts from The Nature In Us. Now as you can see from the graphic it is nearing 1.5 million views. That's beyond my comprehension as far as how that works. As you can see by the other graphic, my actual blog website has just gone over the 1 million mark of views. That surprises me also since most of the people who read my posts do so from the email they're subscribed to for notification of posts. Obviously people are coming up with links when they search on the internet. What a blessing!